Development of the trophont and sporogenesis of Coccidinium duboscqui inside Peridinium balticum. Chatton and Biecheler 1934. Spores of Coccidinium duboscqui. Chatton and Biecheler 1936. Diagnosis_Species: Coccidinium duboscqui Chatton & Biecheler. Intranuclear parasite of Peridinium balticum. Infection starts inside the host nucleus, which is rapidly digested. The trophont produces a synenergid nucleus. Sporocyte nuclei are spherical, producing a rosace. Chromosomes (4-5 in total) have a V-shaped morphology, typical for Syndiniales. The whole process is rapid (24 hours), and the host is still swimming during the whole maturation process (like in Amoebophrya ceratii). Free-living spores with helmet ("spores à casque"). Note that the polyenergid mode described by Chatton and Biecheler in 1934 and 1936 likely corresponds to another parasite ressembling to Parvilucifera. 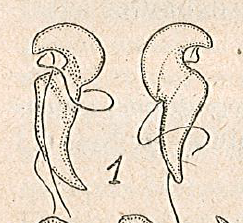 This parasite kills rapidly its host and forms a kyst (= the sporangium). Sporogenesis ends by the production of a central vacuole, and spores are liberated throughout pores ("sporoductes") that belong to the sporangium. Chatton and Biecheler in 1934 and 1936 described infections to be sometime intranuclear sometime intracytoplasmic (as it is reported in Parvilucifera). These differences may be explained by the confusion of the different parasites. All species/morphotypes forming only cysts (Coccidinium legeri, C. punctatum, and C. meslini) likely reported an infection by Parvilucifera, and are thus considered here as doubtful. duboscqui: In honor of the Pr. Duboscq. This is the type species of the genus.